Cascade Falls as it emerges from the limestone cave system of the Claron Formation. The cave system is the product of sinkholes within the water-soluble rocks of the Claron Formation of the Markagunt Plateau. This incredible cascading waterfall first formed when an ancient lava flow dammed the drainage in a narrow valley, creating Navajo Lake. Water from this lake found its way through the water-soluble marl (freshwater limestone) of the Claron Formation, eventually forming a cave system that extends a little over a mile from below the southeastern end of Navajo Lake to the Pink Cliffs escarpment at Cascade Falls. 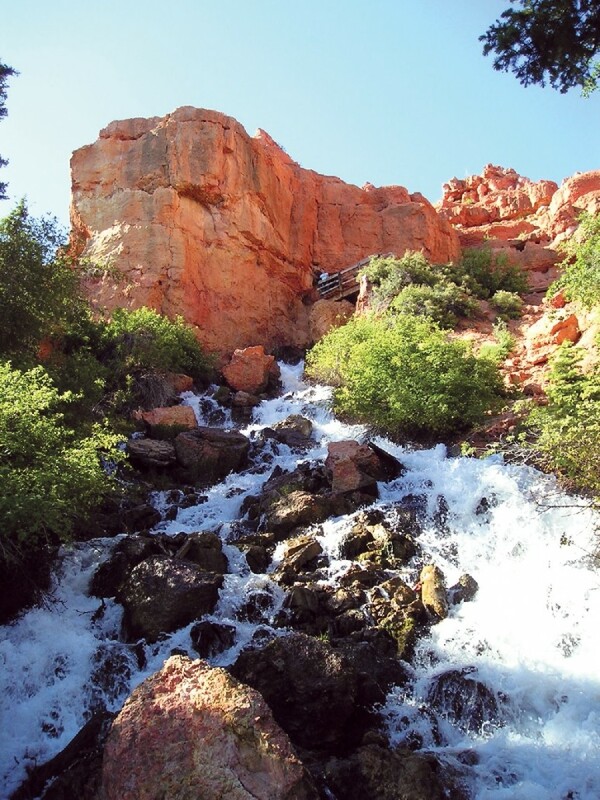 Depending on the level of Navajo Lake, the waterfall can range from a small trickle to a raging torrent. During dry years, Navajo Lake is kept from completely draining into the sinkhole that feeds Cascade Falls by an engineered earthen dam. 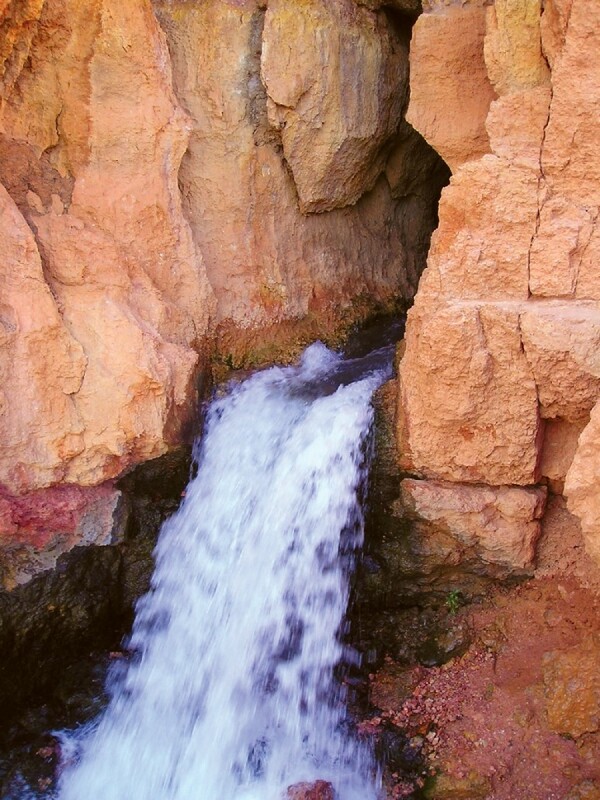 In wet years, however, when the lake inundates the small dam and fills the entire valley, the sink acts like a bathtub drain, allowing lake water to flow southward through the underground cave system and emerge at Cascade Falls as the headwaters of the North Fork of the Virgin River. When the lake level is low enough for the dam to be exposed, the overflow can be seen draining into the cave system through a small opening in the bottom of the sinkhole. Sinkholes, also known as sinks, are depressions caused by the collapse of subterranean caverns, often formed by the dissolution of water-soluble rocks such as limestone or marl. Sinkholes and collapse features are common within the Claron Formation of the Markagunt Plateau and can be seen in abundance along State Highway 14 between Midway Valley and the Duck Creek Sinks. 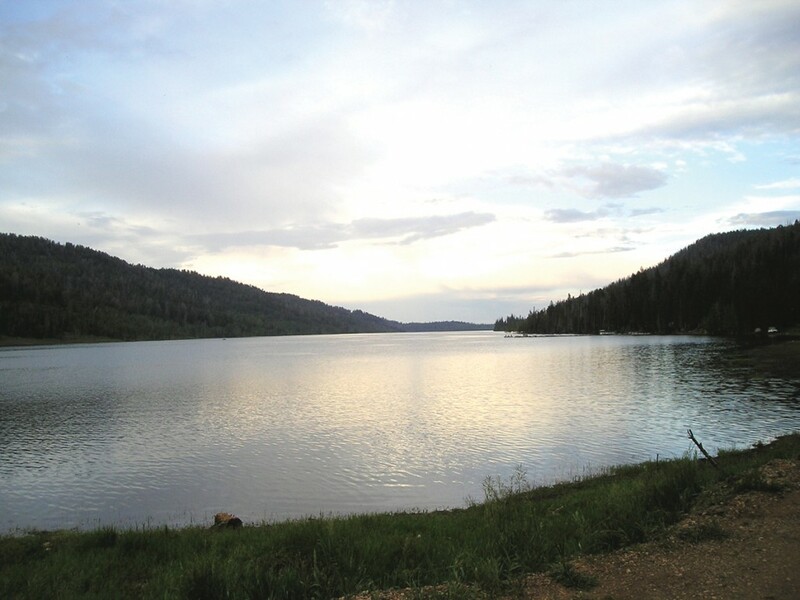 Navajo Lake itself is fed by numerous springs along its western margin that are likely recharged by snowmelt flowing into sinkholes in adjoining Deer Valley. 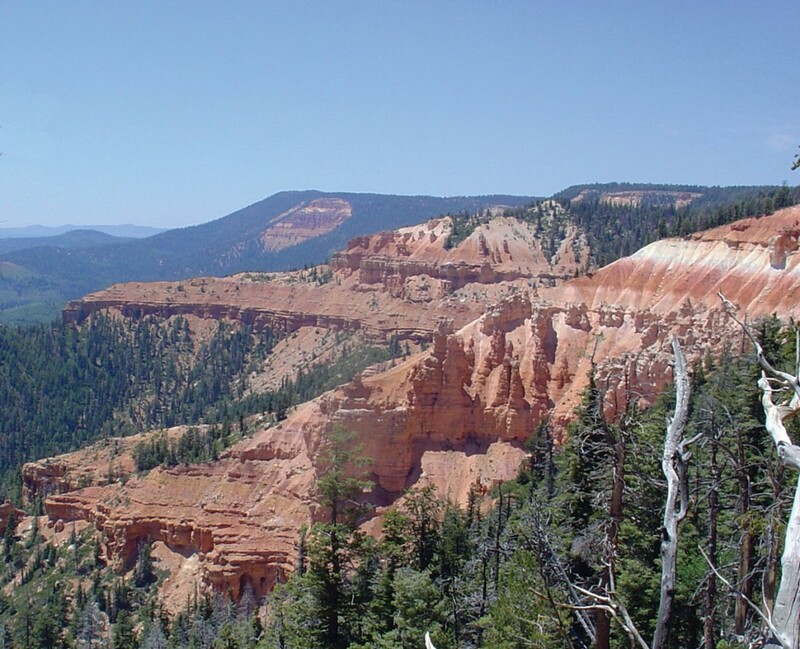 The distinctive Claron Formation is the same geological layer that forms the picturesque towers and hoodoos of Bryce Canyon National Park and nearby Cedar Breaks National Monument. The rocks of the lower part of this formation were deposited on a broad alluvial plain with shallow lakes and ponds around 50 million years ago, during the Paleocene and Eocene Epochs. The formation contains alternating layers of limestone, marl, calcareous sandstone, and minor conglomerate; the layers are vividly colored orange, red, pink, and white by a combination of sediment composition, weathering (oxidation) of iron-bearing minerals, and soil-forming processes. Cascade Falls is located in southern Utah, just south of State Highway 14. Highway 14 can be accessed from I-15 in Cedar City on the west or from U.S. Highway 89 at Long Valley Junction on the east. To get there from I-15 and Cedar City, head 27 miles east on Highway 14. After passing the Navajo Lake scenic pull-out with its descriptive signs, turn right (south) on the road to the lake. After 0.4 mile, the road splits. 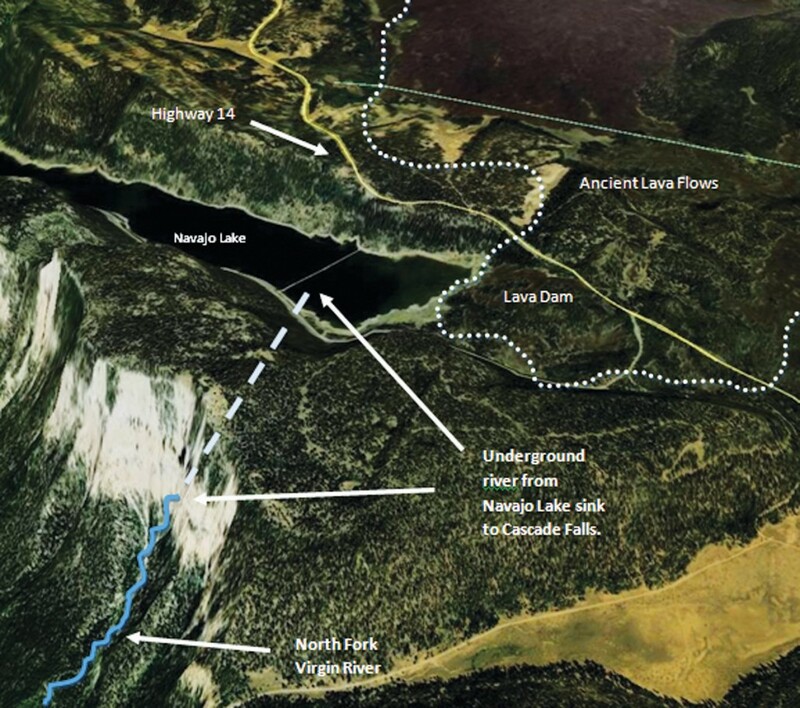 The right fork goes on to the Navajo Lake boat docks and lodges, and the left fork goes approximately three miles (stay right at the “Y” junction to Duck Creek) to the Cascade Falls overlook and trail parking lot. The trail to the falls is approximately 1/2 mile one way.